FAIQ #9: Do You Listen to Irish Music (Really)? Q. 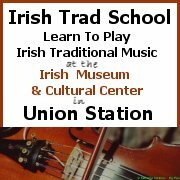 Do You Listen to Irish Music (Really)? A. Well yeah, but it mightn’t be what you mean by Irish music. And anyway, maybe I’m only saying that. But I like to document things. For truth. • FAIQ #8 What’s Your Favourite Irish Song? • FAIQ # 7 What’s Irish Radio Like? • FAIQ #5 : What’s Your Favourite Irish Saying? This entry was posted on Monday, August 14th, 2006 at 4:48 pm and is filed under 1-eolai, FA Irish Q, Luke Kelly & Dubliners, Pogues, Wild Clover Band. You can follow responses via my RSS 2.0 feed. Both comments and pings are currently closed. Chumbwamba??? I haven’t listened to them since Tub thumping came out. wow! I have listened to several of the others at different times and in general I like many types of music, but I find something special when I’m listening to live music in a pub or smaller setting. See you at O’Dowd’s tonight. Not tonight Crash. Right now I’m in Ireland. Will be back in a couple of weeks though.